Since the early 1900s, economists have believed in a concept called “economies of scale,” which means a savings of resources (money, material, equipment, space, energy, people, time, etc.) in production due to size. 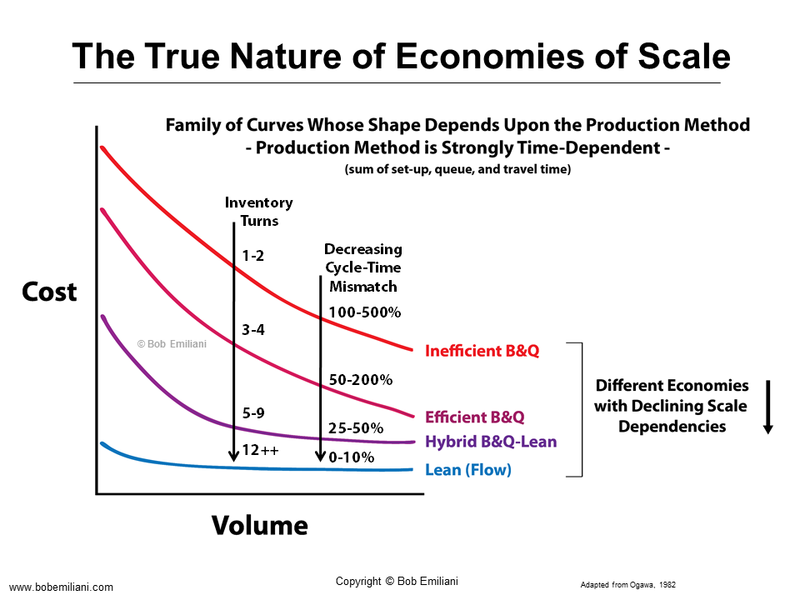 The image below shows an economies of scale cost curve, expressing the relationship between cost and volume, which has been very influential in guiding the thinking of business leaders for many decades. But a funny thing happens in economics once an idea is established: it is nearly impossible to kill. Economists assume their esteemed colleagues did good work, and the economies of scale curve, while overly simplistic, seems to makes intuitive sense. So the idea is accepted and thereafter taken as the undisputed truth, never to be questioned. Or, if questioned, results contradicting the accepted view will be immediately ignored – e.g. diseconomies of scale (meaning, they accept the upside [savings] and minimize or ignore downsides [total costs]). This does not happen in science or engineering, and it illustrates the odd nature of economics (and, relatedly, business, because economies of scale remains firmly rooted as a useful concept in management practice). I have always found it incredible that economists see no reason to study Toyota’s production system. After all, a central focus of economist’s is the efficient use of resources in productive work, for both micro- and macroeconomies. Economists apparently view Toyota’s production system as nothing more than a minor tweak to batch-and-queue production, and therefore not worthy of investigation. What a huge mistake in judgment. Fortunately, one economist took an interest in Toyota’s production system and blew a big hole in the economic lot size concept and re-drew the cost curve to better represent what is actually going on in relation to economies of scale. His name is Professor Eiji Ogawa. He did this pioneering work in the late 1970 and early 1980s while working in the Department of Economics at Nagoya University (located near Toyota’s headquarters). The image below shows the effect of reduced set-up times on cost and lot size. So, rather than economic lot size being understood as time-independent (i.e. 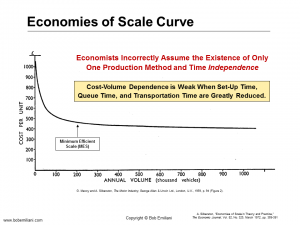 set-up times are fixed and cannot be changed), it is clear that economic lot size is actually time-dependent. Set up times can vary from months to weeks to days to hours to minutes to seconds. Many operations textbooks today, however, still consider economic lot size to be time-independent. Economists, not knowing the details of production, seem to think all set-up times are fixed and lengthy in duration, part queue times are long, and part travel must be a long distance. But as we know in Lean, the idea is to get material and information to flow, which requires reducing set-up time, queue-time, and part travel. 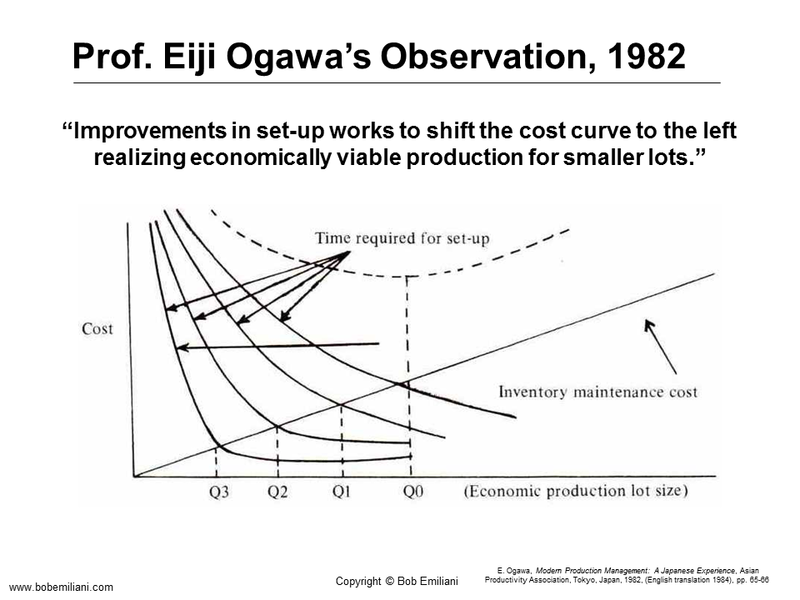 Ogawa’s graph (left) tells you why set-up reduction is so important, yet few companies do this well. Set-ups, whether in manufacturing or service processes, must be 9 minutes or less. So what does this mean in practical terms and in relation to economies of scale? 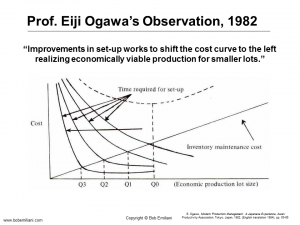 It means that economies of scale, like Ogawa’s cost-lot size curve, is not one curve, but a family of curves representing different economies based on the production method used. The image below shows that as the overall (macro-level) production process improves (i.e. reduced set-up time, queue-time, and part travel), cycle time mismatches decrease and inventory turns increase. Production is actually time-dependent because many different methods can be used to produce goods or services. 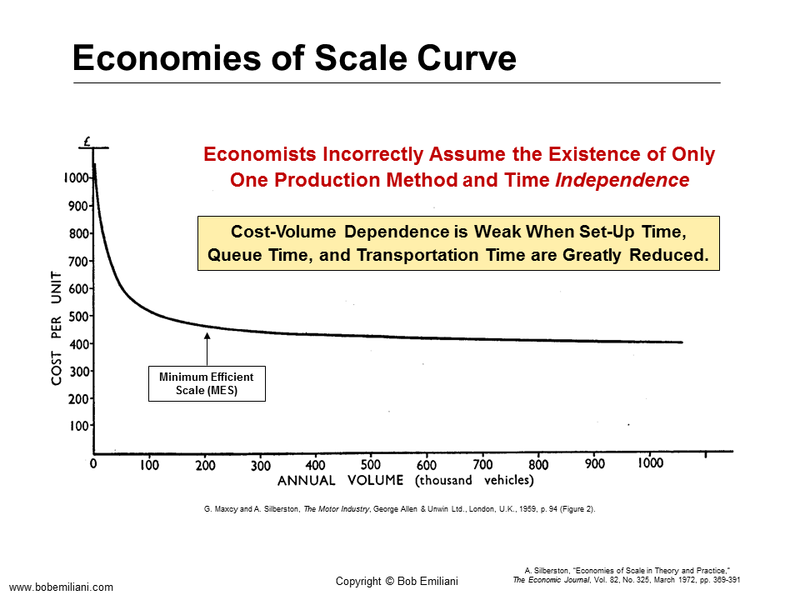 In contrast, the economies of scale curve is considered by economists to be time-independent – a major mistake, as is their dismissal of diseconomies of scale, both intrinsically and as a function of production method (the upper curves representing greater diseconomy compared to the lower curves). 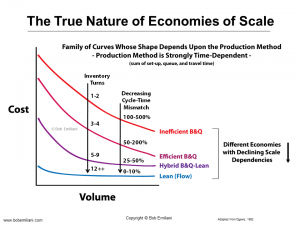 The implications for leadership are obvious: forget about economies of scale (volume). It is far more important to reduce set-up time, queue-time, and part (or document) travel. Greatly reducing time and distance is critical to the long-term success of an organization, yet this cannot be done in isolation of Lean principles and the other Lean practices and methods (as Art Byrne will emphatically tell you). Most managers behave as if they serve sellers’ markets, where one can take lots of time to make decisions. Most organizations serve competitive buyers’ markets, where time is short and leaders must take action quickly. Managers often behave in ways that disrespect people (e.g. employees, suppliers) and slow down or cut off the flow of information, thereby slowing or stopping processes – even though everyone looks very busy. People in leadership positions are more susceptible to illogical thinking and decision-making traps, and which are reinforced by organizational politics (itself a huge time waster and speed reducer). Managers rely on time-independent metrics created long ago for sellers’ markets, and which are not appropriate for use in buyers’ markets. The conventional focus among people who study leadership is on intangible factors such as having a charismatic personality or being an authentic leader. This illustrates a severe lack of critical thinking. Time, material flow, and information flow are a critically important function of leadership. This unique perspective is the focus of my graduate leadership course at the university and my executive training course outside the university. I hope you want to learn more about it. You can do so by reading my books. Just a few weeks ago while coming back from a meeting at a DAX company (a well respected car manufacturer), I expected the expenses of travel costs to be paid rather smoothly (the company is on a lean track over the last 10 years, and won some prizes in this context). Interestingly when this company is dealing with “real” customers buying their products things of money are matters of days normally. Honestly I think they have the wrong leadership on board that is not aware that processes, as small as the described are happening at multiple times. If leadership is only focusing on the “real” production it misses faulty processes in other areas, that for sure will bounce back as information flows that are cut, and delayed raise future problems in the business processes. Sounds like a company that thinks of Lean narrowly as a manufacturing thing. Too bad. Finance and administration leaders are status quo. They think Lean does not apply to them. I’ve dealt with it too. Hello Bob, just a question about how we can interpret the diagram Ogawa: What is Q0, Q1, Q2 and Q3 and how exactly interpret it? Q0, Q1, etc. are lot sizes, which decrease in size as one moves to the left on the graph. For example, from 10,000 pieces to 1000 pieces, to 100 pieces, to 10 pieces. Reducing set-up time allows one to reduce the lot size, reduce lead-time, and improve material flow.